By day, 6-year-olds Connor, Amaya and Greg go to school like everyone else. As night falls and they put on their pajamas and activate their animal amulets, they magically transform into superheroes – Catboy, Owlette, and Gekko and become the PJ Masks! Together they embark on action-packed adventures, solving mysteries and mayhem across the city. Watch out night-time baddies – the PJ Masks are on their way, into the night to save the day! Join Catboy, Owlette, and Gekko on their exciting missions into the night to save the day! Romeo is egging the city with super stink eggs and only the Gekko-Mobile’s camouflage stands in his way. But an embarrassed Gekko won’t admit he’s lost his vehicle. Meanwhile, Catboy needs to conquer his fear of performing in the school concert and take back the school instruments from Night Ninja to help his friends. 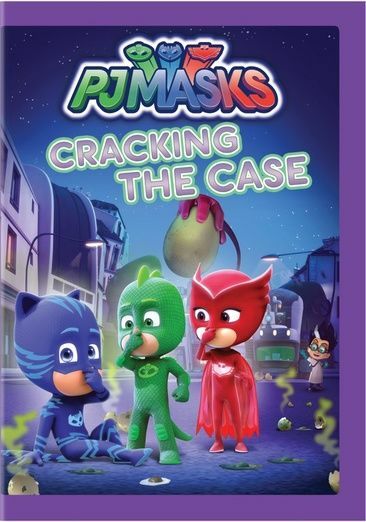 CRACKING THE CASE includes six full-length episodes for over an hour of PJ Masks fun and will make a great addition to any little hero’s Easter basket this spring! You can reserve your copy today on Amazon.